Another Coin Project. This time a Key Chain. 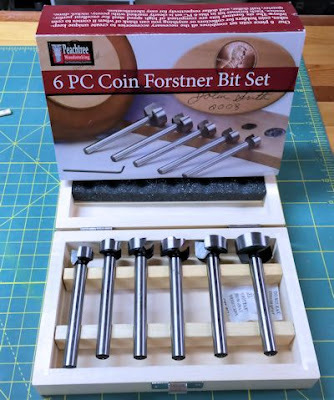 Here is another quick and simple project using the coin forstner bit set. 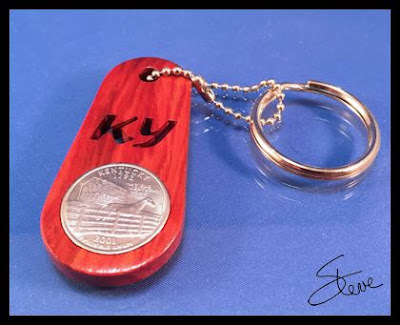 This one is a key chain with the abbreviation of every state. Man I love these simple projects that end up looking great. Sometimes it's just nice to go out in the shop and put something together fast. You don't always have time to cut fancy fretwork but you need that shop fix. Grab a piece of nice hardwood scrap left over from another project and within an hour you can walk out of the shop with a nice gift for someone. I purchased this 6 PC Coin Forstner Bit Set from Amazon.com. Here is the link. I received it today and was wanting to make a quick project. 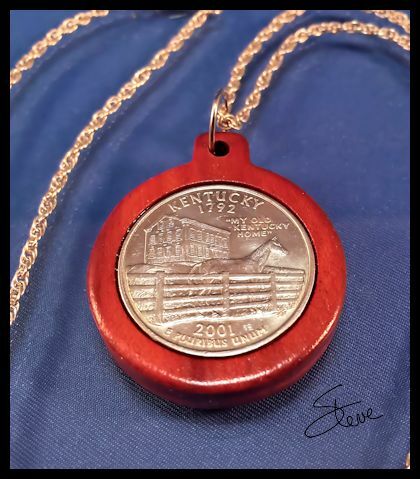 I designed this simple pendant using the Kentucky State Quarter. The set comes with a bit for the US Penny, Nickel, Dime, Quarter, Half Dollar and dollar. I can think of several different projects with this set. The fit of the coin is very nice. You can also buy a depth stop with the kit but if you have a drill press you can just use the stop on the press. The kit cost 29.95 on Amazon. brand new quarter. If you need to find a good choice for jewelry supplies check out Fire Mountain Gems and Beads. You can find finished Sterling Silver and Silver Plated chains are very low prices. If you plan to make jewelry to sell its a nice place to start looking for supplies. I'm thinking these pendants if made well could bring $20 to $25 in the right location. There so simple to make it might be worth taking a few to your next show just to see how they do. Wedding Table Numbers Scroll Saw Pattern. I have had several requests for this pattern. I'm not much of a wedding expert but apparently it is common to have table numbers on the tables at the reception. The numbers in this pattern book go from 1 to 30. Obviously you can cut only the number or either of the graphics depending on how simple you want them to be. You also have the option of adding a backer to make sure the fretwork shows up. Just stack cut an extra heart shape then cut the fret work after separating the hearts. To make the numbers two sided just stack cut three and remove the third before you make the interior cuts. I would probably use 1/8" thick wood if you make them two sided otherwise they get pretty thick. Well the first day of the new catalog seemed to go very well. There were over 4,200 patterns downloaded today. The speed of the catalog stayed stable and I have had no reports of major issues. I trusted my developer but I was still holding my breath. Thanks to all of you who provided feedback during the BETA test. It was helpful and made the catalog better. Changes were made because of your comments. I had over 100 readers who responded to my request for help finding a rotating tip screw to make custom blade clamps. Many thought I was looking for replacement thumb screws for the DeWalt or Excalibur saws. I appreciate the feedback but that's not what I'm looking for. I want a generic rotating tip set screw. I will add this to a knob of my choice to make a custom blade clamp. Many sent me to sites where they sell swivel tip screws. Again that's not what I'm looking for. The set screw in the DeWalt and the Excalibur are not swivel tip screws. They have an insert that fits into the end of the screw. They rotate but do not swivel. Close but not the same. I'm still searching and have not been able to check all the sources I was sent yet but I'm starting to thinks these screws are not available as an off the shelf product. I do thank everyone that searched for me. I'm still going to keep looking. 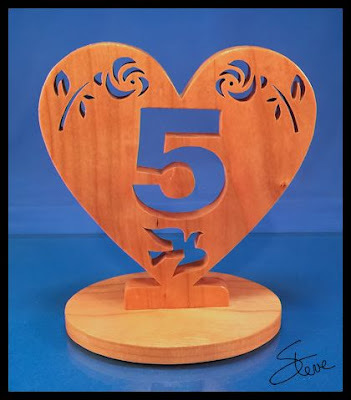 American Workshop television show showing scroll saw work. I'm always browsing the internet for scroll saw related content. I ran across this video on the WBGUTV public television web site. 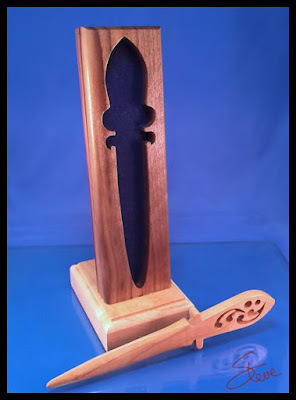 Scott Phillips and his wife discuss a couple scroll saw projects. I have always liked Scott. Here is the link to the video. It's about 30 minutes and a fun watch. The new Scrollsaw Workshop catalog is ready to be released tonight. The old catalog will still be available for a short while. I was having issues with the old catalog and this is the replacement. Watch the video below to get a quick update of the new catalog and it's features. You can access the catalog from the blog. The link is in the left column. You can also get to it from this link. 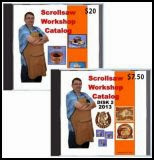 Scrollsaw Workshop Catalog. The new format is pretty simple but you may pick up a pointer or two if you watch the video. Thanks to Shane Shuford of Shuford Technology for all the hard work in developing this product. If you need any online or mobile development I highly recommend Shuford Technology. You might find it easier to view the video if you watch it in HD and full screen. Just start the video and click the YoyTube logo in the bottom right. It will take you to the video on YouTube where you can change the settings. Don't be too surprised if the catalog is sluggish for a couple days. It will probably get hit pretty hard. Feel free to look around but if it gets slow just come back later and things should speed back up. This is the thumb screw from the DeWalt DW788 scroll saw. 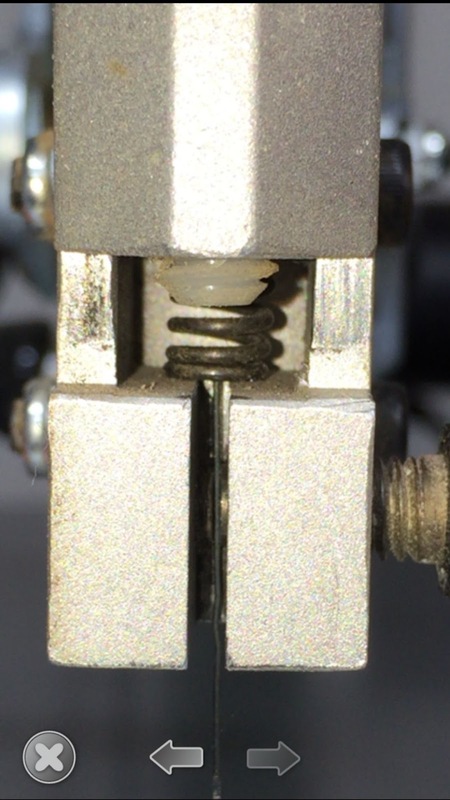 The tip of the screw rotates. This helps prevent the blade from twisting when tightening the clamp. I have a question. Does any one know the name for this type of screw. Does anyone know of a source for a rotating tip screw. I don't meant a replacement thumb screw for the DeWalt. 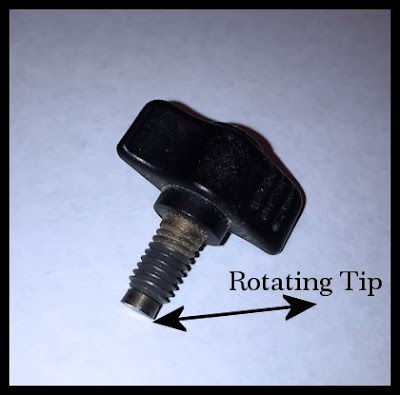 I just want a name and source for a generic rotating tip screw. I have searched McMaster-Carr without finding anything. Maybe this is a special made part but I doubt it. 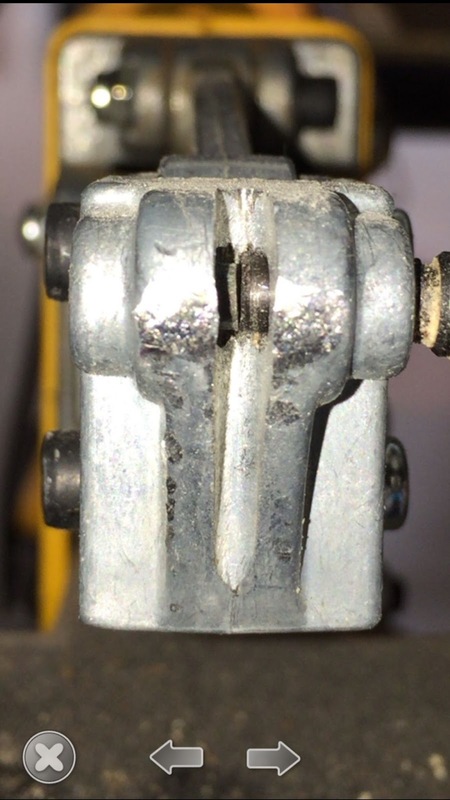 This first picture shows a clamp that is in need of some maintenance. Look closely at the contact points of the set screw and the thumb screw. Notice the gap at the top. This is probably because the blade chuck has bent from over tightening. It's common to want to over tighten the clam when the blade start slipping out of the clamp. This is not the solutions. What you probably need to do is replace the set screw and thumb screw. I have prolonged the life by lightly sanding the points but you have to be very careful to keep the two point straight. In the case of this clamp assembly I need to replace the set screw, thumb screw and the blade chuck. For the DeWalt that's going to cost around $40 with shipping. that's for upper and lower clamps. I have in the past shown how to make or buy larger knobs for the thumbscrew. The thumbscrews can be hard on those with weak or sore hands. The above damage can be caused by the extra torque you can gain from the larger knob or lever. That's why I always give the warning that you want to be careful with the larger knob. Just use modest pressure. If the blade is slipping you need maintenance not more torque. Thisis a picture of the Excalibur upper clamp.The set screw has been sanded a couple times but it's still in decent shape and holding well. 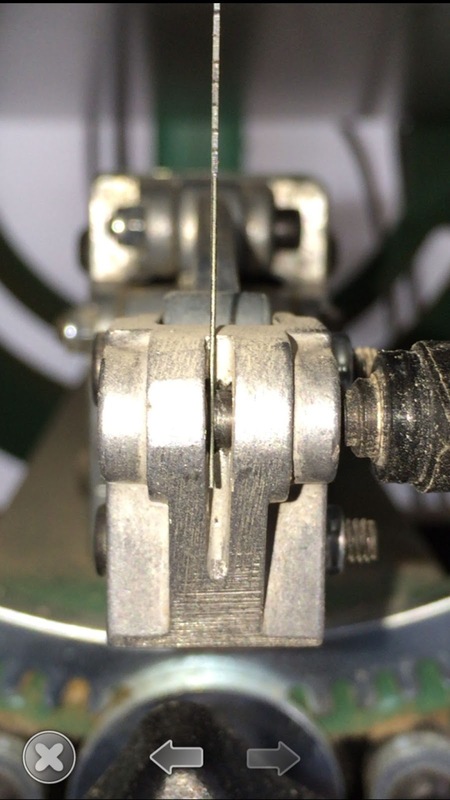 The picture is a little off but the blade is centered between the two contact points which is what you want. Thispicture shows the lower clamp of the Excalibur. Notice a couple things here. The blade is centered and in full contact with the set screw and thumb screw. You can also see a little spec of blue on the left set screw. This is removable Loctite blue. It prevents the setscrew from vibrating out but is removable with hand tools. With out the Loctite the set screw will eventually move. If you notice that it's moved you can just adjust it but sometime that gets over looked. The Loctite keeps it in place once adjusted. You can buy Loctite from most hardware stores. This last picture shows a badly adjusted lower blade clamp. See how the blade is not centered in the blade chuck. The left set screw needs to be adjusted to recenter the blade. These tips can apply to other scroll saws as well depending on how their clamps work. Keep the set screws and thumb screws maintained. Make sure they are adjusted so the blade rides centered in the chuck. Do not over tighten the thumb screw. If the blade is slipping check these tips. If you sand the tips, do it gently. Don't remove material. Just lightly rough up the tips. Get a replacement set when needed. They are not that expensive when you consider the aggravation of slipping blades. A little removable Loctite on the left set screw can help keep it in place. School Time. Hall Pass Scroll Saw Patterns. Shared pictures from Andrew Rose. I had a request from a teacher for a design of hall passes. This is a very simple design of four different passes. There is an Office Pass, Boys Pass, Girls Pass ans just a Hall Pass. Cut them out, paint them and put some cord in the hole. I know a lot of you have teachers in the family so maybe you can use these also. I received these pictures from reader Andrew Rose this weekend. 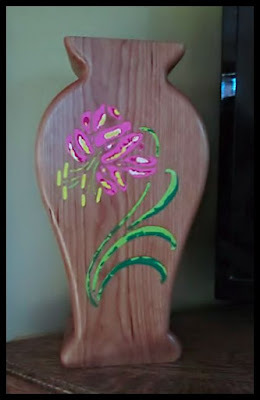 I thought he and his wife did a fantastic job with one of my vase patterns. This is one of the vases from the second book of vases I sell. Andrew and his wife combined to make what he calls "His and Hers" vase. 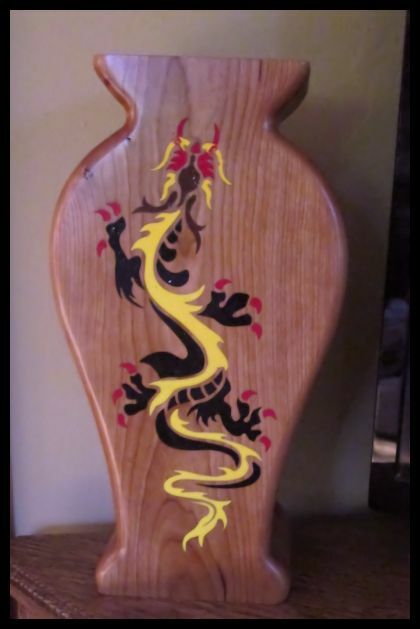 Andrew scrolled and inlayed the dragon on one side. Hi wife chose the alternative pattern for the back. She did the inlay work on the other side. Now they just turn the vase depending on the look they want that day.Nice job guys and thanks for the picture. 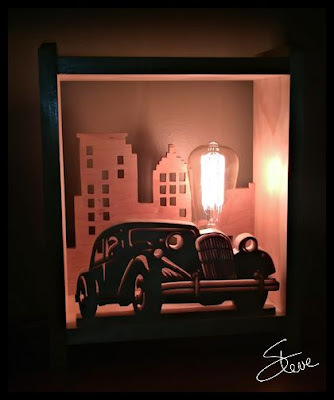 Vintage Shadow Box Lamp with Edison Bulb. I have wanted to do a project with one of the replica vintage Edison bulbs that have been available in stores for a while. These bulbs can be the focus of a project instead of just lighting. 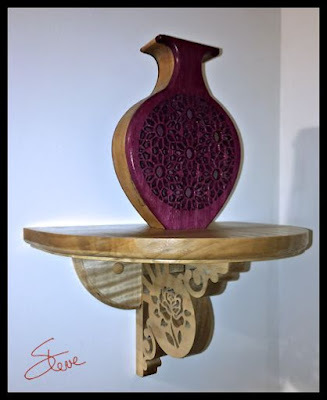 The lamp stands 14 inches tall and 11.5 inches wide. 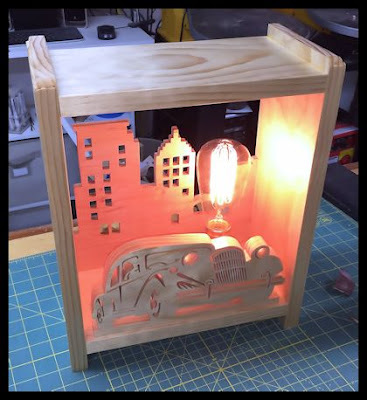 I used a bottle lamp kit from Home Depot to mount the vintage bulb. I put all the instructions for building the project in the pattern. I also show everything needed for the project. I built the lamp from a piece of clear pine that was 8' X 5.5" X.75". The most difficult part of this project it cutting the grill of the car. It does take some care to cut. I used a scroll reverse #3 blade. Lay out the entry holes carefully to avoid getting them too close together. It's more of an art piece than a practical lamp but it looks nice in a dark room. We should make billions of bucks! This is going to be big. I can feel it in my bones. Those of you who know me know I am a geek to the core. I love technology. I have been buying gadgets since the wheel was invented. That's just shortly after grass was invented. I carry an iPhone 6 plus with all the bells and whistles. 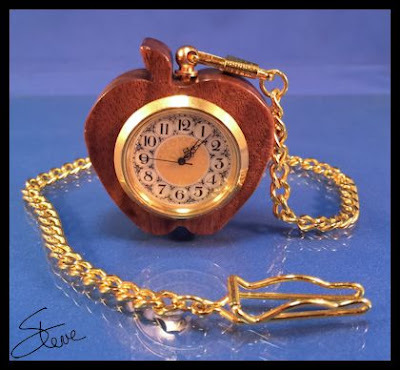 As almost everyone on earth knows, Apple released their much anticipated Apple Watch recently. It's estimated that they sold 4 millions watches. The entry level watch sells for $349. If you add that up it's about $1.5 Billion. I just could not bring myself to buy a watch again. I gave up watches years ago for a cell phone. As much as I wanted the newest geek fest it just was not going to happen. That's when the magic struck. We have the technology to do it our self. From that instant of pure genius the apple Pocket Watch was born. This is going to cost just a few bucks, not hundreds like Apple gouges us for. I figure we can easily make them for under $20. If we can sell them for a 50% discount we can get $174.50 retail. We undercut apple and still make millions. It's a get rich quick scheme. I'm sure it will work. Just look at the features. 1. No charging every night. Just replace the battery a couple times a year and you are good to go. 2. Accurate time keeping with a beautiful and simple user interface. Nothing new to learn. 3. The operating system never needs updating. No constant rebooting or looking for settings that are hidden from any reasonable search. 4. Built in security chain. Attaches securely to your belt. 5. No annoying notifications interrupting your nap at work. 7. No Chinese children working in sweat shops just to feed our lust for technology. 8. No stupid heart rate monitor telling us what we already know. We are couch potato 100+beats per minute old folks. 9. No pedometer bugging us to get in our 10,000 steps today. 10. Best of all it's made right here in the good ol' USA. You are free to make and sell as many of these as you like. Just don't call me when Apples $500 an hour lawyers come calling. You might want to consider calling it the Lemon Watch or maybe the Tangerine Watch. Just a thought. Sources for the chain are included with the pattern book. The clock insert is a standard 1 7/8" requiring 1 3/8" diameter hole. 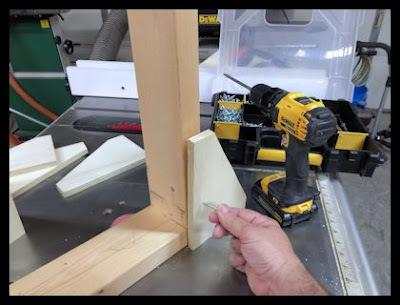 You will need a 1 3/8" forstner bit to drill the hold. 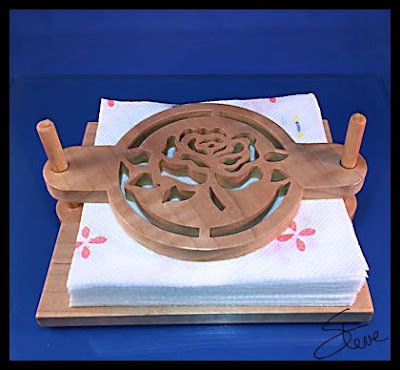 Picnic Napkin Holder Scroll Saw Pattern. Let's practice cutting curves. Don't let the wind blow away the napkins on your next picnic or cookout. 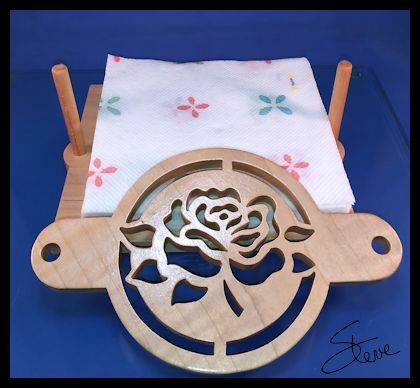 This napkin holder will keep them right where they are needed. I used 1/2" Thick curly maple and 3/8" hardwood dowels. The only real challenge to this project is cutting the curves well. 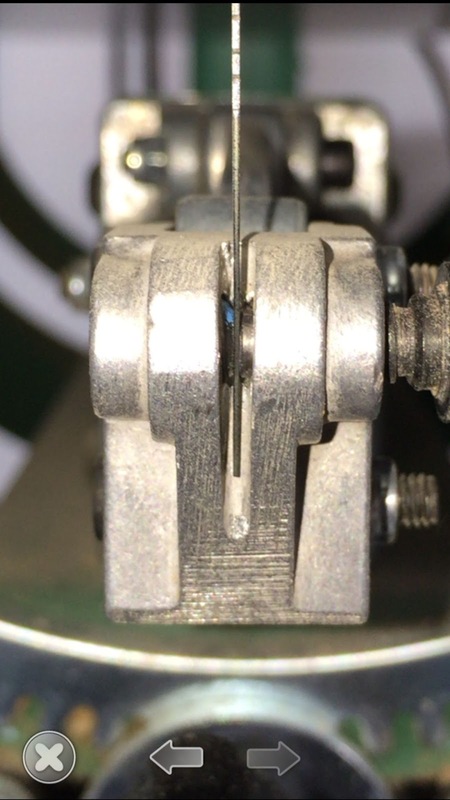 The outer and inner rings need to be cut accurately or it will look sloppy. If you need to brush up on cutting circles and curves take a look at this video tutorial. It will give you a few pointers. Eight Inch Mother's Kitchen Plate Scroll Saw Pattern. These plates can be difficult to cut from hardwoods because of warping. The plate is eight inches in diameter. 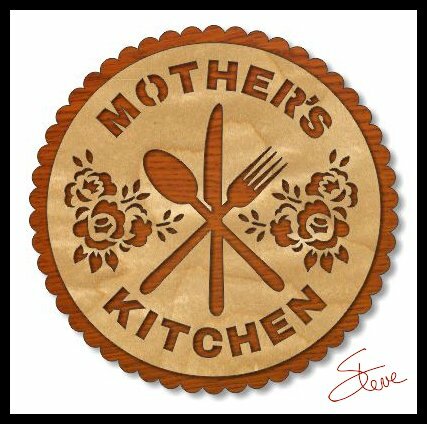 I recommend 12" X 12" sheets of 1/4" Baltic Birch plywood. If you want the contrast like the picture you can apply a lite stain to one of the pieces. Steve Garrison recently released a new YouTube video showing a different techniques for making his shells. Watch the video and if your interested in learning more you can check out his web site. 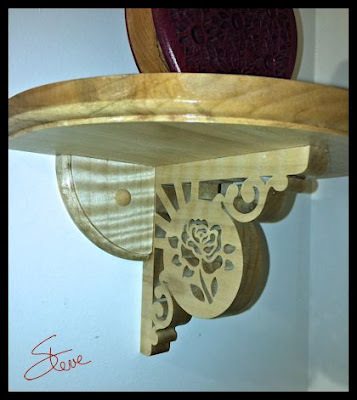 Rose Shelf Scroll Saw Pattern. 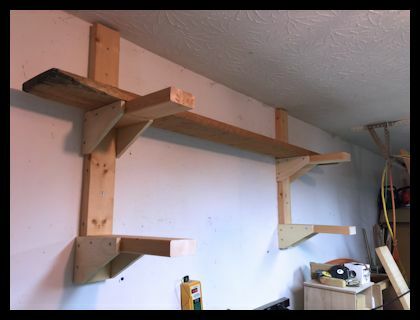 This wall shelf is 10.5 inches wide and over 7 inches deep. 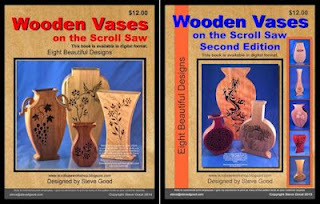 It's just the right size to hold one of the wooden vases from my book "Wooden Vases on the Scroll Saw" (Shameless plug). It could also hold a nice vase of flowers if you insist. You get the picture. It's made from 3/4" thick curly maple. The bottom of the shelf was routed with a round over bit set deep enough to show the whole profile of the bit. The same with the wings. The shelf is not that large so it needs the round over to give the shelf a little less bulk. The wooden buttons are plugging the screw holes. Letter opener and stand scroll saw pattern. Three designs. There are three different designs in this pattern. The letter openers are 7 3/4" long. Each one has it's own stand. The stand leans back at 10 degrees and has finger holes to grab the letter opener. The stand is felt lined. The stand is made from two 1/2" thick wood blanks that are glued together after the cut out is complete. The base of the stand is 1" thick to give the stand stability. 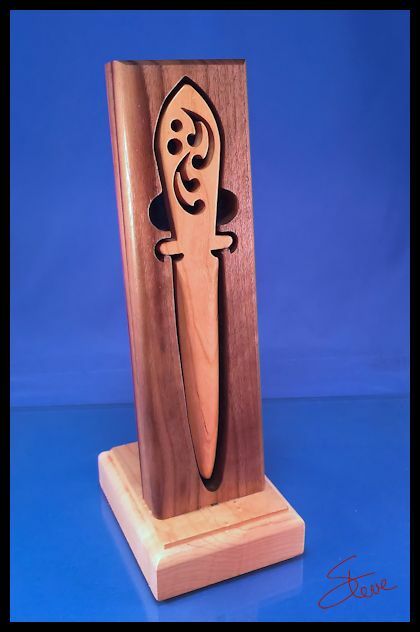 The letter opener is cut from 3/8" wood. You could also use 1/4". I used power sanding to bring it to a nice sharp edge. Give your wood some love. I don't typically store much lumber in the shop. I prefer to let the lumber yard do the storage for me and just go buy what I need when I need it. Of course I have to keep some on hand to do quick projects. The other night I heard a loud noise from the shop. I thought someone had drove through the over head door. When I slowly opened the door there was no wrecked car but there was a pile of wood on the floor. My miserly metal brackets that I have used to store lumber on for over 10 years finally gave way. I knew they were slowly starting to sag but I put off replacing them. Gravity eventually took over and down came all the lumber. 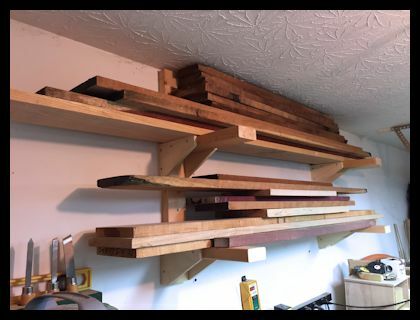 Like always I took a tour of YouTube to see what other woodworkers were doing to make their own lumber racks. I found what I wanted and scaled it down to meet my needs. I removed the cheap metal brackets and installed 2X4s with 5" screws into the studs. I used a level to get them straight. The brackets are made form 2X4 and 1/2" Plywood. I cut the side part of the bracket from a 8"X8" square of plywood. Notice in the picture that I have the side bracket screwed to the support bracket so it will saddle the wall posts. I'm using square drive flat head screws to draw the parts tight. 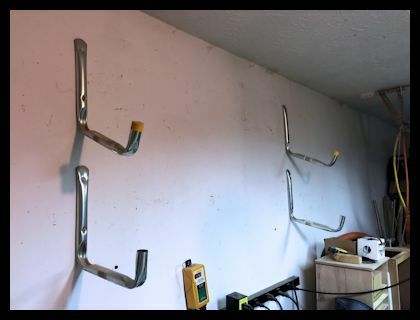 I carefully slid the assembled brackets over the wall post and again leveled everything up. 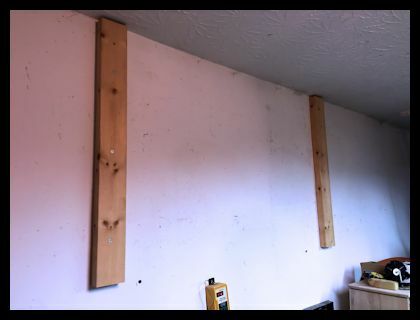 I screwed the side brackets into the wall posts with 3" flat head screws. I used two on each side but I may go back and add another screw just for a bit more insurance. I didn't try to hang on them but I pulled pretty hard and they seem very sturdy. Time will tell but I don't think they are going to come down. I loaded the lumber rack with my modest supply of boards. Obviously this system can be expanded to any size. For more support I could add a third rack between the two. I had to buy the 1/2" plywood. It was around $11 for a 2'X4' sheet. I used a little over half of it. I already had everything else so it was pretty cheap to replace the poor metal brackets I had.